About 1993 an old friend of mine wanted to buy a new turntable, he owned his old turntable since his youth, it was a Thorens TD125 Mk2, which was kept beautiful and shiny all these years. The rest of his setup was Quad 44, 405 and ESL. He asked me about options, and instead of telling him to buy a Linn Sondek or a Garrard, my brother and me went into Thorens tuning. We had done it some times before for other friends who didn't have a lot of money. The tuning steps aren't that expensive, but had quite some effects on the sounds. This has to be done because of the play in the platter bearing. The original Thorens bearing has quite big play when filled with oil, you can rock the platter, if you know what I mean. 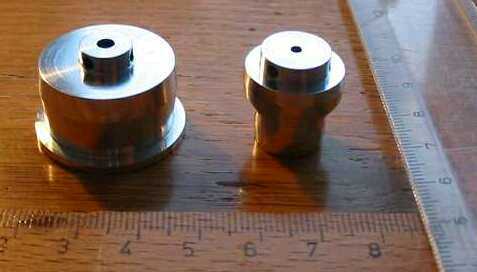 Just take some bycicle grease or Molybdenum grease and the platter will stand in the bearing rock solid. Sonic effect: midrange and treble are a lot more clear and clean, bass gets more solidness and definition. The subplatter and platter assembly is ringing. To cure this, we used as damping compound a stuff we found in the sanitary section of hardware stores: always elastic sealing compound for bath rooms. In Germany such can be bought under the name "Plastic-Fermit". You need the entire one pound box for a Thorens with metal subchassis, and maybe half a pound for Thorens models with wooden subchassis. Sonic effect: one whole octave deeper bass, more organised in rythm and timing, treble much more refined. The reason why one should only use one half pound for Thorens models with wooden subchassis is that otherwise the music gets overdamped and boring. The original motor pulley is a nasty plastic thing with some kind of starter clutch. 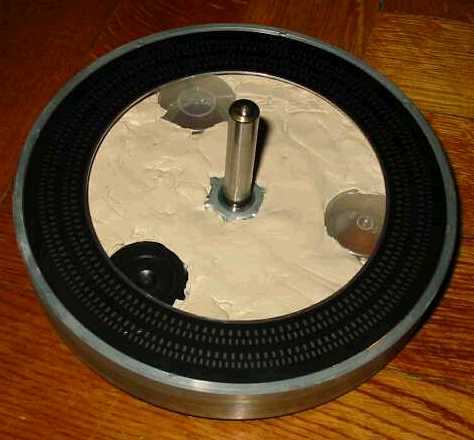 I recommend to replace this with a metal motor pulley, like one can buy directly from Phonosophie. Sonic effects: More and clearer treble, enhanced resolution. BTW. We did step 3 at first, and had a quite unbalanced presentation then, the TD125 sounded thin. 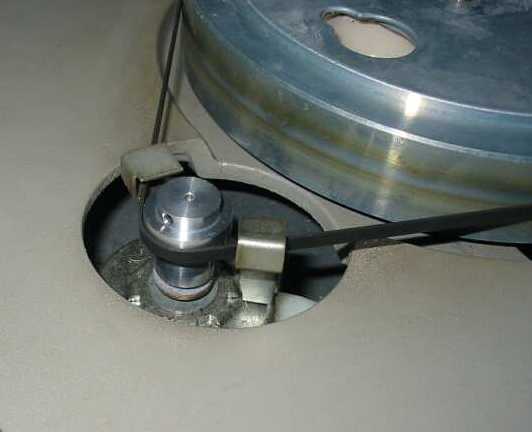 It was not until we did step 1 and 2, that a natural sounding balance was reinstalled. We replaced the original rubber mat by a thick Suede mat (a leather mat with a mat and a glossy side). It is advisable to use the mat side upside. Timing and rythm got more natural with this. Cleaning and adjusting the tonearm bearings. I will give no details here, because I would like to discourage you: you can damage your tonearm if you are not experienced. There are even more tuning steps possible: one could use Linn LP12 springs for the subchassis of TD160 and similiar models. Those are stiffer and more self damped. Though I preferred the deeper bass from the Thorens springs. I did not try the Phonosophie subchassis springs for Thorens yet (they are available for TD160 and the likes only, though). A French audio writer once presented other methods of tuning a Thorens in the L'Audiohile magazine. The modifications consisted of reinforcing the wooden frame and the subchassis by glueing pieces of hard wood to those parts, mainly. I did not try those mods myself, so I cannot comment on their effectiveness. Well, one day, it was in 1997, said friend came to me and wanted me to adjust the subchassis springs. 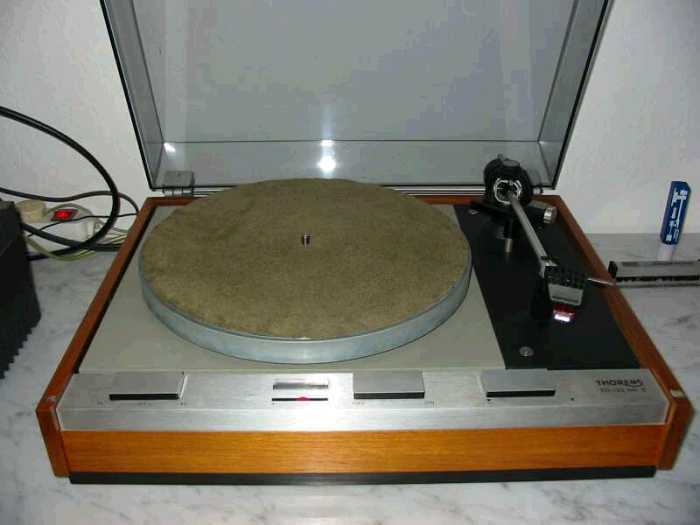 At that time, I had a Platine Verdier and a Scheu turntable both running side by side. We put a record on the Scheu and the Platine, and also on above modified Thorens. The Thorens did not have either the dynamic impact of the Verdier nor the deep bass of the Scheu, but it was crisp and clear and I enjoyed it, it was real fun with pop music, and I liked the Thorens very much in midrange and treble, and I also liked its rythm and pace similiar to Linn LP12 it delivered from the grooves of the record. These tuning steps are highly recommeded to everyone who has an old Thorens and lacks the serious money to buy a real expensive turntable. The modifications bring the Thorens to a sonic level, where turntables cost several thousands Euro.